A decade ago, I drank a lot more Zinfandel. I've changed, but Zinfandel has changed more. No grape has put on more weight in California. It's driven to some degree by nature: Zinfandel ripens unevenly and to get a whole cluster ripe sometimes requires letting some of the grapes get overripe. But it's also driven by the more-extreme-is-better philosophy that infects American cuisine in everything from hot sauce to vegetarianism. As a group the wines were pretty good, though subtlety is not in vogue. Most are over 15% alcohol, and I heard one vintner brag repeatedly that his wine is a good, balanced food wine because it was "only" 14.5%. You guys need to get out more. That said, it's not fair to judge Zinfandel by the standards of Syrah or Grenache because its natural alcohol level is higher. And that's part of the charm for its fans: when good, Zinfandel is a delightful blast of fruit with some complexity, manageable tannins and a kick like a mule. 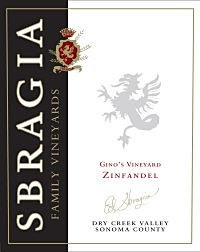 I've listed my tasting notes in alphabetical order, but I'll cut to the chase: the '06 Sbragia Gino's Vineyard was amazing, a swoon-worthy wine, that shows that great Zinfandel really can be both full-fruited and balanced. I was also very high on the '07 Mauritson, and there were more than a half-dozen others that I'd be happy to have a bottle of -- albeit more likely while watching the baseball playoffs than with dinner. What causes your red-wine headache?